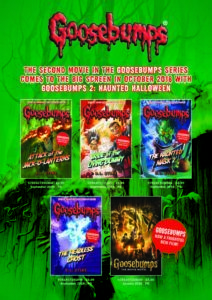 Get Goosebumps this Halloween – Bounce Sales & Marketing Ltd.
Scholastic are bringing the chills this Halloween with these top Goosebumps titles perfect for putting the frighteners on young readers. The new movie, Goosebumps 2: Haunted Halloween is out in cinemas from Friday 19th October 2018. The last film, out in 2015, starring Jack Black was a huge box-office success so be sure to be ready for all the readers eager for another fix. Simply download the order form, fill it out and contact your local rep.